I’ve officially finished my dress for the Reyna garb. I spent 6 straight hours sewing, ironing and otherwise working on it, but it’s done. 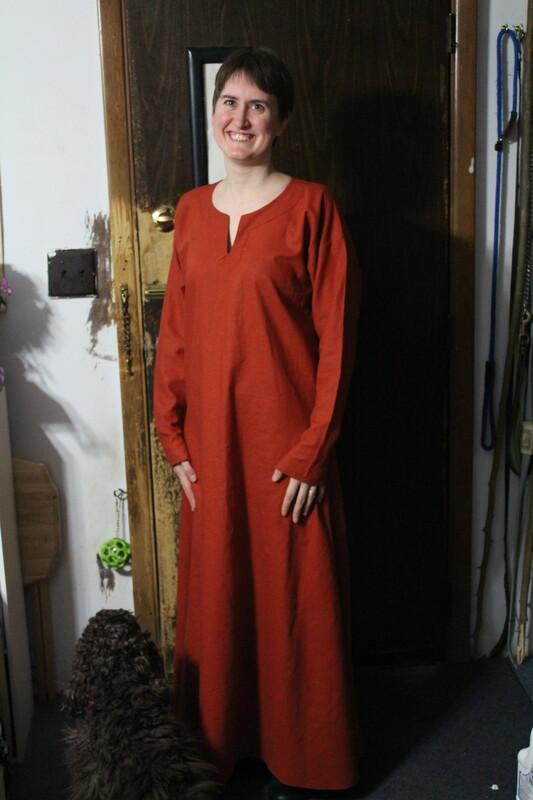 The pattern used was from an SCA handout that you can still find online for a viking kirtle. A viking woman would have shorter sleeves without the little gap so that they could be longer and I could still fit my arms in and would wear this under an apron dress (which Reyna will not be doing). Reyna will wear it with an assortment of belts, cinches, scarves and other things at various times depending on the mood and the needs of the moment. Currently it doesn’t have them, but there will either be laces or a hook-and-eye to close the keyhole slit. It’s a finishing touch that I just didn’t feel up to today, and since I have to do some TLC work on the husbands kirtle tunic, well… It just makes sense to wait a bit. So, with that done, and the odds and ends I either already own or have recently finished, I’m ready. I can be dressed for the event now without adding anything new and still look like my character (and not freeze to death like my existing tunic would have required). Feels great to be finished and ready… Now I just have to set my fangs for the final touch. Expect a photo of the next bits as they come together. The final fully-garbbed photo isn’t far off now!